The Ashlad Who Made the Princess Say "That's a Lie!" Once five women were reaping in a field. Each of them was childless and wanted a child of her own. Suddenly they came upon a giant goose-egg. It was as big as a man's head. "I saw it first," one said. "I saw it just as soon," yelled another. "What? I mean to have it. I was the one that first set eyes on it!" snarled a third. They went on quarrelling over the egg and were quite ready to tear each other's hair, but at long last they agreed to keep it all five of them and sit on it like the goose does, to hatch out the gosling. The first of them sat for a week like a broody goose and had an easy time of it. She didn't have to work while the others toiled to feed themselves and her. Then one of them cursed her for being lazy in a goose's way. "You couldn't twitter till you'd been in the egg a while yourself," said the one who was brooding. "But in this egg there's something human, I tell you. It seems to be mumbling "Herring and gruel and porridge and milk" over and over again. Now you can sit on it for a week, and the rest of us can feed you in turns." After the fifth woman had been sitting there brooding for a week, she could hear beyond doubt that there was s curious creature inside the egg. It went on shouting for "Herring and gruel and porridge and milk," So she picked a hole in the eggshell. There burst forth a human child with a big head and a little body. The infant was as ugly as could be, not anything like a gosling. His first cry was: "Herring and gruel and porridge and milk!" They agreed to call him Rumble-Mumble Goose-egg. Rumble-Mumble Goose-egg overheard their complaints and at once got ready to leave. If they could do without him, he could do without them, he said. Off he went. He walked far and asked for service on a farm in the pretty country. It so happened they were in need of a labourer. The old man who owned the farm, told him to clear stones from the fields. Rumble-Mumble picked up the stones well. He gathered big ones that made up several cart-loads each, and put the whole lot, both big and small, into his pockets. Soon he had finished his job and went back to the farm to find out what to do next. "Clear away the stones form the field," said the farmer. "You've hardly begun, young man." The tall Rumble-Mumble Goose-egg now emptied his pockets and threw all the stones in a heap, so the farmer could see he had done the work very well. But from this moment on the farmer felt he ought to watch his step with such a strong man. He told him he had better come in and have something to eat. This suited Rumble-Mumble. He cleaned up the meal at once. There was nothing left for anybody else. And still he wasn't more than halfway satisfied. Nobody could match him as a worker, but none matched him as an eater either. Feeding him was like pouring water through a sieve. "A worker like that could eat a poor farmer out of house and home in three shakes of a lamb's tail," muttered the farmer to himself, and then he found no more work for him at all. It was best that Rumble-Mumble went to the king's farm at once. He did and was taken on. He found there was food and work enough. He was to do errands and do odd jobs. First he could split up a bit of firewood, they said. Rumble-Mumble set to work and sent the splinters flying from his chopping and splitting. He chopped up all the wood there was, timber and wood set aside for planks and tools, and when he had finished he came along and asked what they wanted him to do next. "Finish chopping wood," they said. "There isn't any more," said Rumble-Mumble. 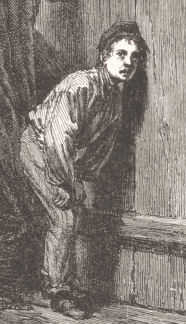 The bailiff came along with him and took a look at the woodshed. Rumble-Mumble had chopped up even the timber logs. The bailiff said this was a disgrace, and that Rumble-Mumble wouldn't get a bite to eat till he had been to the woods and felled as much timber as he had split up into firewood. Rumble-Mumble at once ran down to the forge and had the smith help him make an axe of 250 kilos or so. Off to the forest. He cut down mast-timber and everything else to be found in the woods of the king and those of his neighbours. He left the branches on, and the forests looked as though they had been swept down by a whirlwind. He piled a solid load on the sledge and harnessed all the horses in front. He tugged at their bridles to get the load moving, and then he pulled all their heads of by accident. So in the end he was forced to pull the load to the king's farm himself. The king and forester were standing in the porch when he arrived. They wanted to have a word with him about the way he treated woods, for the forester had been along there and seen it all. But when the king saw Rumble-Mumble dragging half the forest behind him, he lost his nerve. He got vexed, alarmed and all at once saw no reason to fall out with such a man. "You're a fit worker," said the king. "You're hungry now, I bet." They set about preparing food. In the meantime Rumble-Mumble was to bring in a load of wood for the cook. He stacked the whole wood-pile on a sledge, and wanted to pull it though the door. But he was a bit rough again, so that wall timbers were pushed askew, corners slipped out of joint and the whole building nearly fell down. All the same, while this happened, they could manage to make twelve hubs of meal to a portion of porridge for Rumble-Mumble, and much less for the other men around. When the dinner was just about ready, they sent him to call in the men. He shouted so loud that he hills echoed all around as they often do in a thunderstorm, and yet Rumble-Mumble thought the men were too slow in coming. He had a quarrel with them and in so doing knocked the life out of twelve. Food was served. And then there was no need to feed him for a while. "He knocked the life out of twelve," said the king, "and he eats much more than one hundred and forty-eight men, that is twelve times twelve, I reckon. How much work do you do, my lad?" "Much more than twelve times twelve do," said Rumble-Mumble. After dinner he was sent to the barn to thresh corn. He lifted the ridge-pole off the roof to use as a flail, and when the roof started collapsing, he took a giant spruce with all its branches on and put it along the ridge of the roof instead. And then he threshed grand and straw and hay all together. It didn't turn out well. Both corn and chaff were whirled through the air and spread like a cloud over all the farm. When he had almost got the threshing done, an enemy invaded the country. So now the king was at war. He asked Rumble-Mumble to take some men with him, march against the enemy and meet him in battle, for the king was sure the enemy would kill him. But Rumble-Mumble would fight alone. He didn't want to have men with him. All the better, thought the king, the sooner I get rid of him. But Rumble-Mumble had to have a good, solid club. The smith forged a club that weighed 100 kilos, and Rumble-Mumble said it was good enough to crack nuts with. Then the smith forged a club of 250 kilos. Rumble-Mumble said it was good enough to sole shoes with. Anyhow, the smith said it was the biggest job his men could do. And so Rumble-Mumble made a club of 2000 kilos, that is two tons. It took a hundred men to turn it on the anvil. He could make do with this new club. He also had to have a knapsack. They made it out of fifteen oxhides and packed it with food. Off he tramped with his club on his shoulder. He came to the enemy's camp. They wanted to know if he was ready for battle. "Just wait till I've had a bite to eat," said Rumble-Mumble, sat down behind his big knapsack and began his meal. But the enemy wouldn't wait, started firing at once, and bullets showered down on him. But both lead and steel bounced off him, and besides his knapsack gave plenty of cover. "I can do without all this firing and shooting," said Rumble-Mumble. And yet they went on. They even started throwing grenades and shooting cannonballs. "There's no need to tickle me," he said each time one touched him. Then he got a grenade stuck in his throat. "Ugh," he said and spat it out. Next there came a chain-shot that cut through his butter-box, and then another chain-shot carried off a sandwich he was holding in his hand. "That does it," he muttered. Angrily he jumped up, seized his big club and drummed it on the ground. He asked them if they meant to keep on blowing the bread out of his mouth with their pea-shooters. He beat on the ground so that hills and mountains trembled and the enemy were scattered. That was the end of that war, for all we know. He returned to the king and asked for more work. The king grew pale, for he had hoped to get rid of him this time. The only thing he could think of was to send him to hell. "Go off to Old Nick (the devil) and collect the rent at once," he said. Off went lonely Rumble-Mumble with his sack on his back and his dear club on his shoulder. He made a quick journey out of it, but when he got there, Old Nick was busy hearing the catechism for confirmation. None was at home but his mom, and she had never heard of any rent owing. He had better come back some time later, she suggested. "No matter what, I'll wait till I've got the rent I was sent for," he insisted. Time began to drag after he had had his meal. That's why he called to Old Nick's mom once again. She had to pay up straight away. She refused. She wouldn't pay the rent. Then he darted up to the top of a great pine outside the gate of hell, and bent and twisted it lie a willow wand and asked her whether she would pay anyhow. She dared not do otherwise. In a thrice she found as many coins as he could carry in his sack. He set off towards the king's farm. No sooner had he left than Old Nick came back home. He was soon told what Rumble had done, and that he had made off with a big sack of his money, and set out in a big hurry to catch up. But first he took the time to wallop his own dear mother quite a bit for letting go of all that money. Old Nick soon drew near to Rubmle-Mumble. The devil carried no sack, and could fly through the air when he so chose. Rumle-Mumble on the other hand had to keep to the ground with his heavy sack. But when Old Nick came hurrying at his heels, he put a spurt on and racked along as fast as he could, brandishing his club to keep him off. They ran on and on, Rumble-Mumble holding the handle tight and Old Nick grabbing at the head of the club, till they came to a very deep valley. There Rumble showed himself capable of leaping from mountain top to the other. Old Nick flew after him over the valley in such as rush that he dashed foolishly against the club and tumbled down into the valley and broke off his foot. There he lay. "Here's your rent," said Rumble-Mumble when he reached the royal farm, and tossed the sack at the king's feet. Crash, boom, bang, the whole porch shook. The king at once made a fine speech to thank him, and promised him a rich reward and safe journey home if he so wished. But Rumble-Mumble only wanted more work. He was an honest worker. "So what do you want me to do next?" he asked. "Go to the big troll that once stole my grandfather's sword, the one who lives in a castle by the sea where none has ever dared come near." Rumble-Mumble packed some bundles of food in his knapsack and off he went once more. He travelled a long, long way over wild hills this time, till he came to some tall, wild-looking rocks. They were the castle of the troll he was after. But the troll was nowhere to be seen, the rocks were shut, and Rumble-Mumble couldn't find a way in. He fell in with some quarrymen who were quarrying stone in this district. He set about to help, and they had never had such help before. He broke up the mountain-face and split the rocks and sent boulders as big as houses toppling down. When it was time for him to rest and have his dinner, he went to open one of his bundles and found it had all been eaten up by someone. "That could only be the troll," Rumble-Mumble considered, "I have a good appetite myself, but this fellow has eaten all the bones also." The first day was soon passed, and on the second the same thing happened; someone stole his food. But on the third day Rumble-Mumble set out to break stones, he took the third bundle with him. And he was careful to lay down behind it and pretend to be sleeping. The mountain opened while he lay in ambush like that. Suddenly a troll with seven heads came out and started to gobble the food in Rumble-Mumble's bundle. Rumble-Mumble rose rather quickly and struck all the eating heads off with one blow of his club. That was the end of it. He went inside the mountain through the wide open portals the troll had left. Well inside he found a horse eating from a tub of red-hot embers, and behind it was a tub of oats. "Why not eat the oats?" he asked the horse. "I can't turn around. I'm bound. That's why," said the horse. "I can turn you around," said Rumble-Mumble. "I'd rather you tore off my head," said the horse. "That's what the comrade would do. Deeds like these are what a lot comrades are for, you know." "Is that really so?" said Rumble-Mumble, halfway doubting. Yet he did as he was instructed. All once the horse became a fair young man. He told Rumble-Mumble he had been bewitched and changed into a horse by that ugly monster. He also helped Rumble-Mumble to find the sword the troll had hidden at the bottom of the bed. In that bed the troll's own mama lay snoring away. They set off towards the king's farm across the sea. The troll's mama awoke a little after that, and found out what had taken place. She hurried down to the water, but could not catch them. They were too far away as they sailed off in the only boat around. In a rage she began drinking the water. She drank so much that the level of the water sank. She didn't manage to drink up all the ocean, so in the end she burst. "What else was to be expected?" Rumble-Mumble wondered as he sailed on, "I know a bit of that." Rumble-Mumble sent word to the king as soon as they had landed near his place. The king could come and get his sword. He sent four horses, but they could not move it. He sent eight and then he sent twelve, and still the sword stayed where it was. They couldn't make it stir and move. Rumble-Mumble picked it up and carried it along to the king's farm himself. The king couldn't believe his eyes when he saw that one again. But he made a fine speech. After it, Rumble-Mumble asked for more work. He was told to go to an enchanted castle where none dared stay. He was to make his home there till he had built a bridge over the sound nearby, so that people could get across. The king would reward him well, he said. He would even give Rumble-Mumble his own daughter for it. That looked promising, so Rumble-Mumble agreed to the bargain, although none had ever come back from the enchanted castle alive. The king was quite certain that this time he had got rid of him. Rumble-Mumble set off. Along with his food he took with him a good hard stump of pine, a small axe, a wedge, and some kindling wood and little else from the king's farm. He reached the sound. The river was full of ice, but the feet of Rumble-Mumble were firm enough for wading there anyway, so he crossed safely to the other side. He got into the castle at once. Rumble-Mumble warmed himself by the fire and had his supper. He felt ready for a night's sleep, but all of a sudden he heard a terrible din. The whole castle was being turned upside down. All he could see was a gaping jaw as big as the doorway. It was the Devil in one of his guises. He and Rumble-Mumble started to play cards, because it mattered to the Devil. He needed to win back some money Rumble-Mumble had got out of his mom. Yet can you guess who was the winning one? It so happened that Rumble had much luck. He kept winning for it. He won all the ready cash at first, and all gold and silver in the spellbound castle later. It was then that the fire went out. "We must cut some wood," said Rumble-Mumble, who was in luck and needed to see to play. He didn't want to stop. so he struck the stump of pine with his axe so as to cleave it, but the old log was gnarled and tough. It wouldn't split. "You're supposed to be strong," he said to the Devil. "Dig in your claws. Wrench this log apart!" The Devil got to work as hard as he could. While he did his best Rumble-Mumble happened to drive out the wedge so that the Devil got caught in a pucker. Rumble-Mumble understood at once he had an excellent opportunity to try out he head of his axe on the back of the devil and have the time of his life. The Devil begged to get freed, but Rumble-Mumble refused to listen till the devil had promised he would never come and harry anyone there again ever after. He also took an oath that he would build the bridge over the sound so that people could cross it safely summer as winter. The Devil's great project was to be ready as soon as the ice in the river melted. "Those are hard terms," said the Devil. Anyhow, he had no choice if he wanted to be free. In the end he wanted no other bargain, no more deals. And Rumble-Mumble agreed at last. The Devil was set free and sped off and away towards hell - it happened to be his only home. Rumble-Mumble went to bed to sleep and was still asleep rather late next day, as the king came along to see if he lay torn to pieces. Instead he saw gold and silver enough to wade in it. Sacks of the stuff lay heaped along walls, and in the bed Rumble-Mumble lay snoring. "Heaven help me and my daughter," said the king, readily seeing his mistake: Rumble-Mumble was alive and kicking. A wonderful job had he done. Yet the king insisted that there could scarcely be a wedding till after the bridge stood complete. Then one day it happened. The bridge stood all finished, just as the Devil had promised on his life. Rumble-Mumble wanted to take the king with him to try out the bridge, but the king didn't like that new idea. "This bridge check could easily bring on hateful revenge for my hanky-panky tricks!" "Let Rumble-Mumble be, let him be. Then you'll see. or bear all the burden ..."
None else could understand them, so he grabbed his staff at once and hurried away to one of his very distant cottages in the far-away mountains, where he wanted to settle as a hermit to make amends by building a good cloister. He also allowed the big Rumble-Mumble to take over and run the farm and country from that blissful moment, for as the king later said in his cottage, "I had the good fortune to wed my daughter to a man with an enormous appetite. It will bring many blessings." Snip snap snout, that wedding came about. There was once on a time a king who had a daughter. She was such an awful fibber that you couldn't find a greater anywhere. So the king made it known that if anyone could outdo her in telling fibs and could make her tell the truth, he should have her for a wife and half the kingdom into the bargain. There were many who tried. All and sundry would be glad to get the princess and half the kingdom, but none succeeded. Well, there were also three brothers; they were also going to try their luck. The two elder set out first, but they fared no better than all the others. Then the youngest, the ashlad, thought he would try. He set out for the giant palace and met the princess outside the cowshed. "Good-day," she said in return. "You haven't got so big a bull as we have! Look ... And we milk into great big casks." He: "Let me tell you ... I climbed right up to the clouds the other day and there I felt the North Wind resting. I felt stranded as I hovered there in the wide open, but a warming wind candidly let me down. I landed in a fox's hole - the nest of your mother and your father, I think it was! You didn't know your mother gave your father such a blow that plenty of figs dropped from his hair!" The princess shouted: "Father never grew figs in his hair!" By that the ashlad won her! The tale is much shortened, and is about boasting one's way and winning one's way as well. Some rise above that, even into allegorical outlets. At times they seem thin like air, but that's another story. In the old days they believed in skipper's yarn like gospel. A youth had been sailing with a particular skipper as boy one summer, but when they were going out on a trip in the autumn, he got a sullen fit and would not join the ship. The skipper rather liked him, for although he was young, he was very handy and knew his work well. Besides, he was a big and strong lad, and was not frightened to bend his back over a rope. In fact, he was almost as useful as an able seaman already, and always in a merry, lively mood. He often kept up the spirits of all on board, so the skipper did not like the thought of losing him. But the lad had no mind to spend the autumn nights on salt water. He would, however, stay on board till the cargo was in and they were ready to sail. Then one Sunday, when the crew had gone ashore, and the skipper was gone to see a timber-dealer about some planks and firewood for deck cargo, the boy was to keep on board and look after the vessel. And this lad was born on a Sunday, and had found a card with the four of clubs; therefore he was a seer. So he could see the supernatural people, but they could not see him. The boy heard someone speaking in the hold. All at once, as he sat forward in the forecastle, he heard someone speaking in the hold. He peeped through a crevice and saw three coal-black ravens sitting on a cross beam and talking about their husbands, whom they were all tired of and whom they wished at the bottom of the sea. It was easy to understand that they were witches who had turned themselves into ravens. "But are you sure that nobody hears us?" asked one of the ravens. 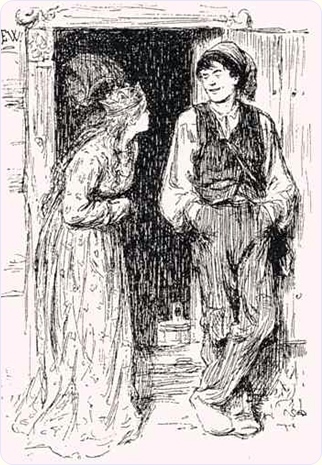 The boy knew by the voice that it was the skipper's wife. "No of course not," said the other two, who were the wives of the first and second mates, "there is none on board." "Well, then I'll tell you; I know a good way to get rid of them," said the skipper's wife, and jumped closer to the other two; "we'll make ourselves into three heavy seas, and strike the vessel and sink it with all hands." The other ravens thought that was the great way of doing it. Now they remained some time and talked about the time and place. "But I suppose no one hears us?" said the skipper's wire again. "Well, you know that," answered the other two. "You see, there is a remedy they could use against us which, if it were used, would be a serious thing for us and would cost our lives." "What is that, sister," said one of the mates' wives. "But are you sure that no one hears us? I thought I saw some smoke from the forecastle." "You know there isn't anyone! We've looked into every corner. They forgot to put out the fire in the stove, that's the reason it smokes," said the mates' wives. "Tell about the remedy!" "If they buy three cords of birch logs," said the witch, "- but they must be exact measure and there is to be no bargaining about the price - and if they throw overboard the one cord of logs, piece by piece, when the first sea comes, and the second cord, piece by piece, when the second sea comes, and the third cord, piece by piece, when the third sea comes, then it's all over with us." "Yes, that's true, sister, then it's all over with us, then it's all over with us!" said the mates' wives; "but nobody knows it." 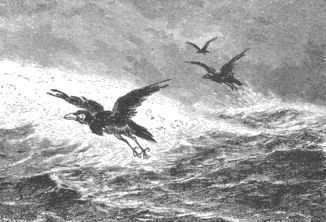 They screeched and laughed aloud, and then they flew up through the main hatch, and screeched and gobbled like ravens. When they were ready to sail, the lad would not for the life of him go on the ship for all the skipper talked to him and promised him. There was no help for it, he would on no account go in the ship. At last they asked him if he was afraid, since it was getting so late in the autumn. Maybe he would rather sit in the chimney-corner behind his mother's petticoats? "No," said the lad, he was not afraid; he thought they never had seen any sign of his being afraid, or using tricks as the land crabs might do. He would prove it to them, for now he would go with them in the ship, but on the condition that they bought three cords of birch logs, exactly measured, and that he was to have the command of the ship, as if he was the skipper, on a certain day. The skipper asked the meaning of this, and if he had ever heard of a boy taking the command of a vessel? The lad answered that it was much the same to him, but if they wouldn't buy three cords of birch logs, and obey him, as if he was the captain for one day only - and he would tell them what day beforehand - he wouldn't set his foot on board any more. Still less would he dirty his hands in pitch and tar on board that ship. That's what he said. The skipper thought it was a very strange idea, and that he was a strange lad altogether, but he agreed at last, because he had set his heart on having the boy with him, and I suppose he thought he could easily manage him when they got out to sea. The mate was of the same opinion. "Oh! never mind! Let him take the command! If we go to seaward we'll have to give him a hand!" said the mate. So the birch logs were bought and correctly measured, and no bargaining was made about the price, and then they sailed. "It's easy to see who has command of the ship now; why not full the sails altogether?" "Not yet," said the lad, "but very shortly." Suddenly a squall burst on them, so violent that they thought the ship would have capsized. If they had not reefed the sails there was no doubt they would have foundered when the first squall struck the ship. The lad now ordered them to throw out the first cord of birch logs, but piece by piece, only one at a time, never two, and they must not touch the other two cords of wood. "The crew was smart in carrying out his orders now, and they did not laugh any more at him, but threw the birch logs overboard, piece by piece. When the last piece went over the side they heard a moaning as from one who is in the last pangs of death, and the next moment the squall was over. "The Lord be praised!" said the crew. "Well, I must say that you have saved both ship and cargo, and I'll report it to the owners - and stand by it," said the skipper. "Oh yes, that's all very well, but we haven't done with it yet," said the lad, "we'll have it worse directly," and he ordered them to furl every sail but the mizen. The second squall came still stronger than the first, and the crew were in a great fright. Just as it was blowing at its hardest the lad told them to throw the other cord of logs overboard. They did; they threw piece by piece, and took good care not to touch the third cord. When the last log went over the side they heard a deep groaning and wind went down. "We have one bout left now, and that will be the worst," said the boy, and ordered every man to his post, while the ship only went under bare poles. The last squall was worse than both the forerunners; the ship gave a lurch and they thought it would never right itself again. The seas washed over deck and gunwale. But the lad ordered them to throw overboard the last cord of logs, piece by piece, not two at a time. When the last log went over the side they heard the moaning of one who dies a hard death. When the wind had gone down, the sea was red as blood as far as they could see. When all was over the captain and the mates said they would write to their wives. "You may as well leave that alone," said the lad. "You haven't got any wives any more!" "What nonsense is that? No wives?" said the captain. "Have you finished them off, perhaps?" said the first mate. "We've all had a hand in that," answered the boy. Then he told them what he had heard and seen the Sunday he was on board keeping watch, when the crew were ashore and the skipper went to see the timber-dealer. When they came home they heard that their wives had disappeared the day before the storm. They had never been seen or heard of since.